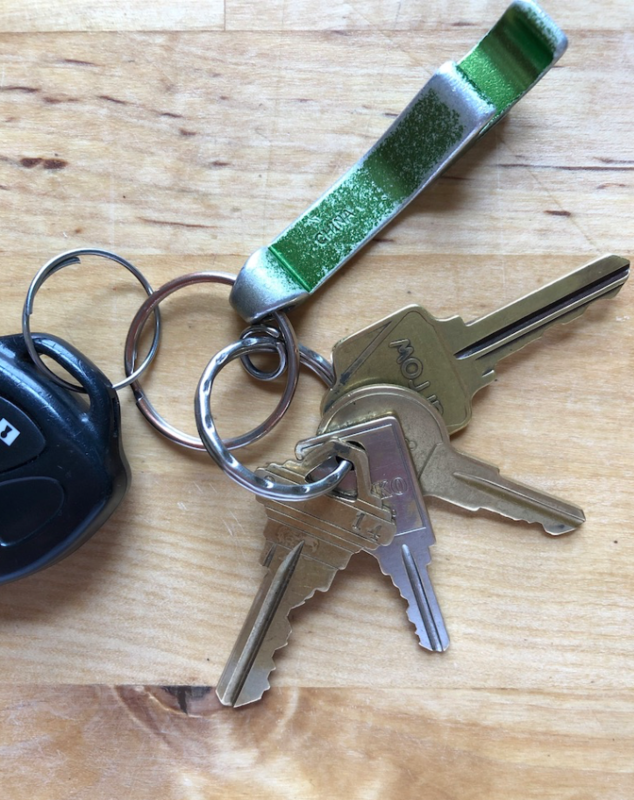 My key ring has a nice heft—it’s big enough that I can feel it in my down coat pocket even when I’m wearing puffy mittens. Part of the bulk comes from a beat-up green aluminum bottle opener my son gave me when I admired his. I used to keep a miniature red Swiss Army knife in my purse because it had a bottle opener, which was handy on picnics for opening pop, and occasionally, beer. After I’d thrown away several forgotten knives at airport security, I wanted a different solution. There’s my house key, of course. My car key is on a flimsier wire loop so I can easily give it to service managers at the dealer. But what are those other three keys? I think the small silvery rectangular key is for locking luggage. But what piece of luggage and why? I never lock my luggage. It’s fabric covered and would be easy to slit if someone wanted my stuff. A lock would be superfluous, a waste. Years ago, did one of my kids ask me to hang onto it? If so, why do I still have it? Maybe it’s a subconscious reminder of the joy of getting away. I love traveling, seeing new places and cultures, visiting my son in California, and seeing my siblings in Ohio. Then there’s a slightly grubby round brass key. The numbers 293 are etched on one side. Hmmm. Does it open a padlock? The kind I might have used on a gym locker? But where’s the lock? It really doesn’t matter, because although I exercise, I rarely work out at a gym where I’d need to lock up my belongings. So it’s a crazy artifact of past good intentions. 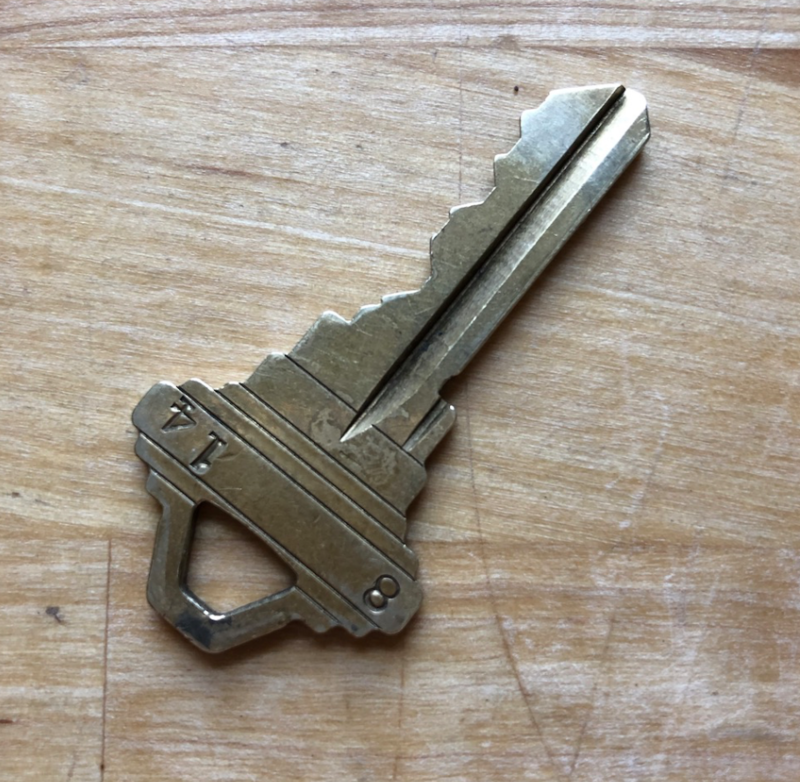 The last key is to my parents’ house in Ohio, one they gave me so I could easily come and go when I visited. Or get in if something happened to them. So I’d always feel welcome. But now my parents are gone and the house belongs to my brother. He doesn’t mind that I have a key to use when I visit, but it isn’t really necessary. I’m only there when he’s there. But that key unlocks a place and time I wish I could still visit.